You can discard 1 “Prank-Kids” card; Special Summon 1 “Prank-Kids Token” (Pyro/FIRE/Level 1/ATK 0/DEF 0), but it cannot be Tributed. 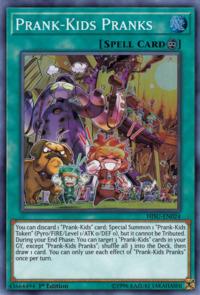 During your End Phase: You can target 3 “Prank-Kids” cards in your GY, except “Prank-Kids Pranks”; shuffle all 3 into the Deck, then draw 1 card. You can only use each effect of “Prank-Kids Pranks” once per turn.